I took my cat to the vet today because she had an injury on one of her legs. It was caught early so there wan’t exactly a lot needed to be done. 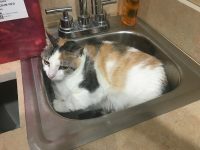 And as many times as I’ve seen photos people have posted of their cat in the sink at the vets office, I never have myself, till today.